Short-sellers hate being caught short a stock that reports a blowout quarter. When this happens, we often see a tradable short squeeze develop as the bears rush to cover their positions to avoid big losses. Even the best short-sellers know that it's never a great idea to stay short once a bullish earnings report sparks a big short-covering rally. Short-squeeze candidates are something that I tweet about on a regular basis. These are also the exact type of stocks that I love to trade and alert to my subscribers in real-time. This is why I scan the market for heavily shorted stocks that are about to report earnings. You only need to find a few of these stocks in a year to help enhance your portfolio returns -- the gains become so outsized in such a short time frame that your profits add up quickly. That said, let's not forget that stocks are heavily shorted for a reason, so you have to use trading discipline and sound money management when playing earnings short-squeeze candidates. It's important that you don't go betting the farm on these plays and that you manage your risk accordingly. Sometimes the best play is to wait for the stock to break out following the report before you jump in to profit off a short squeeze. This way, you're letting the trend emerge after the market has digested all of the news. Of course, sometimes the stock is going to be in such high demand that you risk missing a lot of the move by waiting. That's why it can be worth betting prior to the report -- but only if the stock is acting very bullish technically and you have a very strong conviction that it is going to rip higher. Just remember that even when you have that conviction and have done your due diligence, the stock can still get hammered if Wall Street doesn't like the numbers or guidance. If you do decide to bet ahead of a quarter, then you might want to use options to limit your capital exposure. Heavily shorted stocks are usually the names that make the biggest post-earnings moves and have the most volatility. I personally prefer to wait until all the earnings-related news is out for a heavily shorted stock and then jump in and trade the prevailing trend. With that in mind, let's take a look at several stocks that could experience big short squeezes when they report earnings this week. 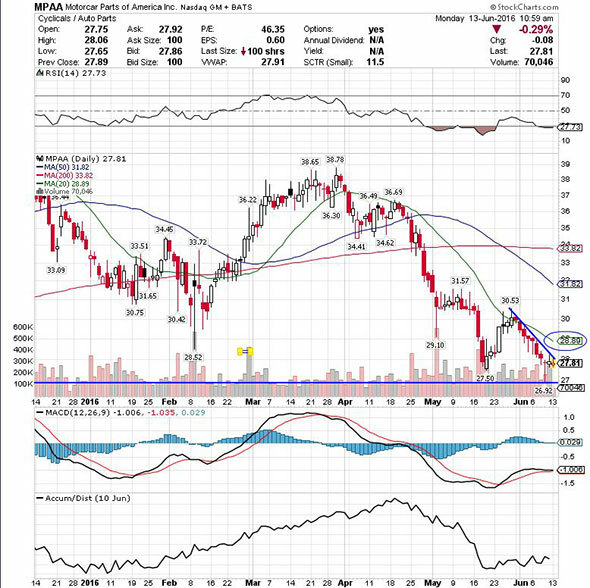 My first earnings short-squeeze trade idea is automotive aftermarket parts player Motorcar Parts of America (MPAA - Get Report) , which is set to release numbers on Tuesday before the market open. Wall Street analysts, on average, expect Motorcar Parts of America to report revenue of $99.89 million on earnings of 54 cents per share. The current short interest as a percentage of the float for Motorcar Parts of America is pretty high at 11%. That means that out of the 16.67 million shares in the tradable float, 1.84 million shares are sold short by the bears. The bears have also been increasing their bets from the last reporting period by 2.6%, or by about 46,000 shares. If the bears get caught pressing their bets into a strong quarter, then this stock could easily spike sharply higher post-earnings as the bears run to cover some of their positions. From a technical perspective, Motorcar Parts of America is currently trending below both its 50-day and 200-day moving averages, which is bearish. This stock has been downtrending over the last three months, with shares moving lower off its high of $38.78 a share to its recent low of $26.92 a share. During that downtrend, this stock has been making mostly lower highs and lower lows, which is bearish technical price action. If you're bullish on Motorcar Parts of America, then I would wait until after its report and look for long-biased trades if this stock manages to break out above its 20-day moving average of $28.90 a share and then above more near-term resistance at $30.53 a share with high volume. Look for volume on that move that hits near or above its three-month average action of 190,414 shares. If that breakout triggers post-earnings, then this stock will set up to re-test or possibly take out its next major overhead resistance levels at its 50-day moving average of $31.82 to its 200-day moving average of $33.82, or even $35 to $36 a share. I would simply avoid Motorcar Parts of America or look for short-biased trades if after earnings it fails to trigger that breakout and then drops back below its new 52-week low of $26.92 a share with high volume. If we get that move, then this stock will set up to enter new 52-week-low territory, which is bearish technical price action. One possible price target off that move is $22.12 a share. Another potential earnings short-squeeze play is tax preparation services provider Liberty Tax (TAX , which is set to release numbers on Tuesday after the market close. Wall Street analysts, on average, expect Liberty Tax to report revenue $103.89 million on earnings of $2.24 per share. The current short interest as a percentage of the float for Liberty Tax stands at 3%. That means that out of the 7.17 million shares in the tradable float, 205,000 shares are sold short by the bears. If this company can produce the earnings news the bulls are looking for, then shares of Liberty Tax could easily spike sharply higher post-earnings as the bears scramble to cover some of their positions. From a technical perspective, Liberty Tax is currently trending below both its 50-day and 200-day moving averages, which is bearish. 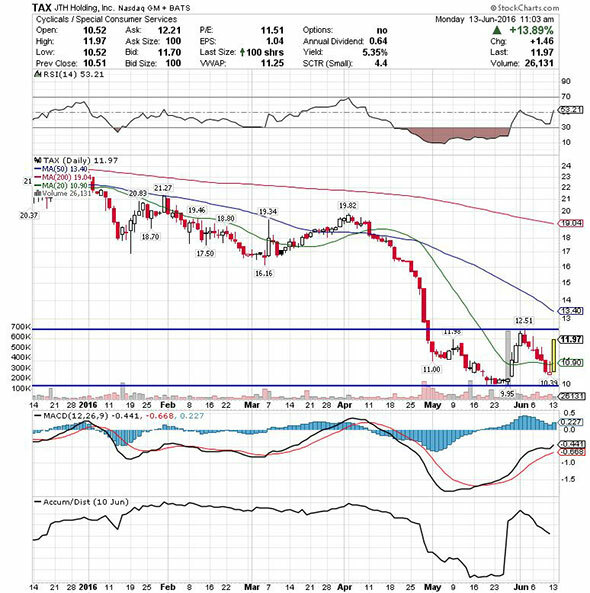 This stock recently formed a double bottom chart pattern, after shares found some buying interest at $9.95 to $10.39 a share. Following that potential bottom, shares of Liberty Tax have now started to uptrend and spike back above its 20-day moving average of $10.90 a share. That move is quickly pushing this stock within range of triggering a big breakout trade post-earnings. If you're in the bull camp on Liberty Tax, then I would wait until after its report and look for long-biased trades if this stock manages to break above some near-term overhead resistance levels at $12.51 a share and then above its 50-day moving average of $13.40 a share with high volume. Look for volume on that move that hits near or above its three-month average volume of 48,045 shares. If that breakout fires off post-earnings, then this stock will set up to re-test or possibly take out its next major overhead resistance levels at $15 to $16, or even $17 to $18 a share. I would simply avoid Liberty Tax or look for short-biased trades if after earnings it fails to trigger that breakout and then drops back below some key near-term support levels at $10.39 to its new 52-week low of $9.95 a share with high volume. 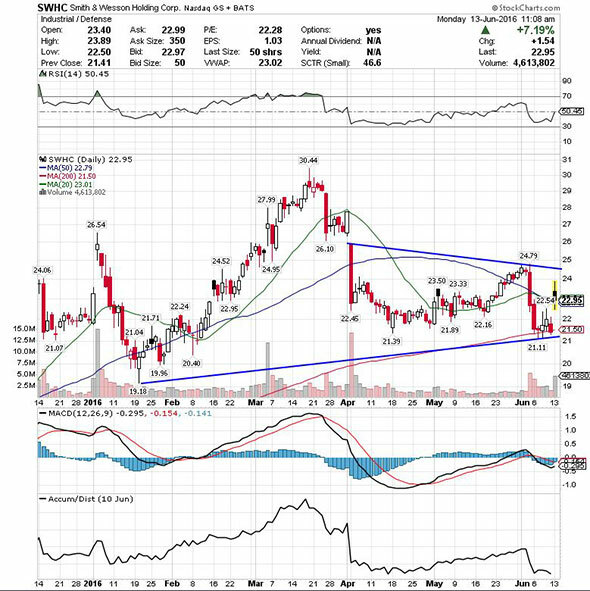 If we get that move, then this stock will set up to enter new 52-week-low territory, which is bearish technical price action. Another potential earnings short-squeeze candidate is firearms maker Smith & Wesson (SWHC , which is set to release numbers on Thursday after the market close. Wall Street analysts, on average, expect Smith & Wesson to report revenue of $214.55 million on earnings of 54 cents per share. The current short interest as a percentage of the float for Smith & Wesson stands is very high at 15.1%. That means that out of the 54.32 million shares in the tradable float, 8.24 million shares are sold short by the bears. From a technical perspective, Smith & Wesson is currently trending above both its 50-day and 200-day moving averages, which is bullish This stock is starting to spike higher on Monday back above both its 50-day moving average of $22.79 a share and its 20-day moving average of $23.01 a share with strong upside volume flows. That high-volume rip to the upside is now quickly pushing shares of Smith & Wesson within range of triggering a big breakout trade post-earnings. If you're bullish on Smith & Wesson, then I would wait until after its report and look for long-biased trades if this stock manages to break out above some near-term overhead resistance levels at $24.79 to $26 a share with high volume. Look for volume on that move that hits near or above its three-month average action of 2.01 million shares. If that breakout takes hold post-earnings, then this stock will set up to re-test or possibly take out its next major overhead resistance levels at $28 to its 52-week high of $30.44 a share. I would avoid Smith & Wesson or look for short-biased trades if after earnings it fails to trigger that breakout and then drops back below some near-term support levels at its 200-day moving average of $21.50 a share to $21.11 a share with high volume. If we get that move, then this stock will set up to re-test or possibly take out its next major support levels at $19.18 to $17.05, or even $16.33 a share. Another earnings short-squeeze prospect is electronic manufacturing services and solutions provider Jabil Circuit (JBL - Get Report) , which is set to release numbers on Wednesday after the market close. Wall Street analysts, on average, expect Jabil Circuit to report revenue of $4.18 billion on earnings of 16 cents per share. The current short interest as a percentage of the float for Jabil Circuit sits at 4.2%. That means that out of 174.02 million shares in the tradable float, 7.30 million shares are sold short by the bear. From a technical perspective, Jabil Circuit is currently trending above both its 50-day moving average and below its 200-day moving average, which is neutral trendwise. This stock has been uptrending strong over the last month and change, with shares moving higher off its low of $16.73 a share to its recent high of $19.68 a share. During that uptrend, shares of Jabil Circuit have been making mostly higher lows and higher highs, which is bullish technical price action. That move has now pushed this stock within range of triggering a near-term breakout trade post-earnings. If you're bullish on Jabil Circuit, then I would wait until after its report and look for long-biased trades if this stock manages to break out above some key near-term overhead resistance levels at $19.68 a share to its 200-day moving average of $20.62 a share with high volume. Look for volume on that move that hits near or above its three-month average volume of 2.56 million shares. If that breakout materializes post-earnings, then this stock will set up to re-test or possibly take out its next major overhead resistance levels at $21.88 to $23, or even $25 a share. 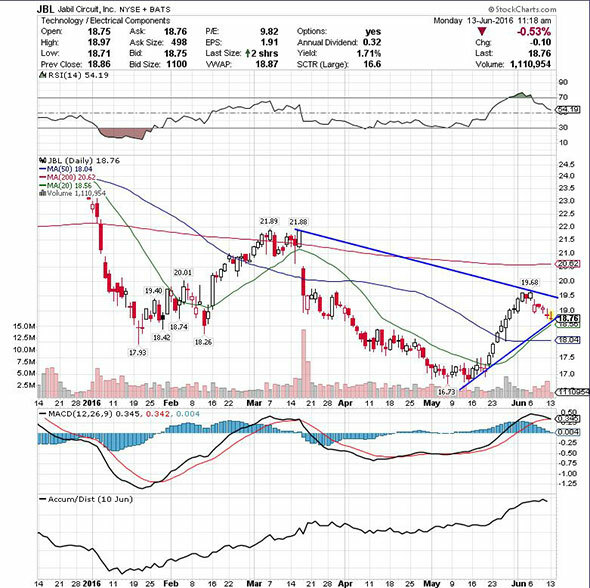 I would simply avoid Jabil Circuit or look for short-biased trades if after earnings it fails to trigger that breakout and then drops back below its 50-day moving average of $18.04 a share with high volume. If we get that move, then this stock will set up to re-test or possibly take out its next major support levels at $16.73 to $14.70 a share. My final earnings short-squeeze trading opportunity is networking and communication devices player Finisar (FNSR - Get Report) , which is set to release numbers on Thursday after the market close. Wall Street analysts, on average, expect Finisar to report revenue of $317.38 million on earnings of 25 cents per share. The current short interest as a percentage of the float for Finisar is notable at 7.1%. That means that out of the 106.35 million shares in the tradable float, 7.65 shares are sold short by the bears. If this company produces the earnings news the bulls are looking for, then shares of Finisar could easily jump sharply higher post-earnings as the bears move fast to cover some of their positions. From a technical perspective, Finisar is currently trending above both its 50-day and 200-day moving averages, which is bullish. This stock has been uptrending over the last month, with shares moving higher off its low of $15.21 a share to its recent high of $17.88 a share. During that uptrend, shares of Finisar have been making mostly higher lows and higher highs, which is bullish technical price action. That move has now pushed this stock within range of triggering a big breakout trade post-earnings. 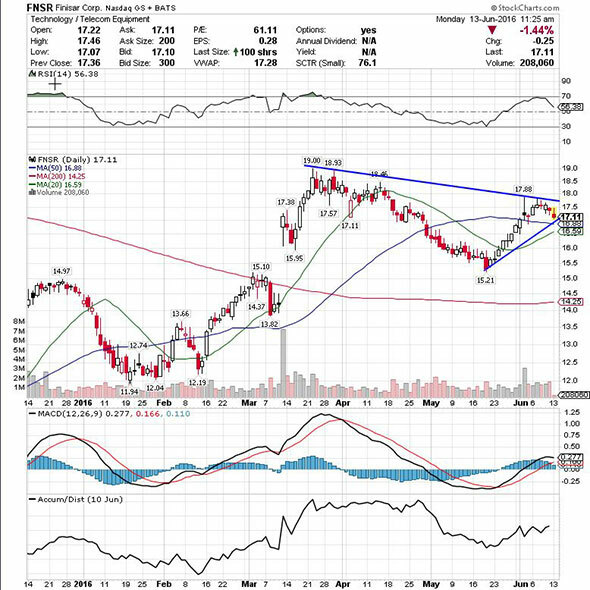 If you're in the bull camp on Finisar then I would wait until after its report and look for long-biased trades if this stock manages to break out above some near-term overhead resistance levels at $17.88 to $18.46 a share and then above more key resistance at $18.93 to $19 a share with high volume. Look for volume on that move that hits near or above its three-month average action of 1.38 million shares. If that breakout fires off post-earnings, then this stock will set up to re-test or possibly take out its next major overhead resistance level at its 52-week high of $22.96 a share to $23.38 a share. I would avoid Finisar or look for short-biased trades if after earnings it fails to trigger that breakout, and then drops back below some near-term support levels at its 50-day moving average of $16.87 a share to its 20-day moving average of $16.59 a share with high volume. If we get that move, then this stock will set up to re-test or possibly take out its next major support levels at $15.21 to its 200-day moving average of $14.25, or even $13.82 a share.